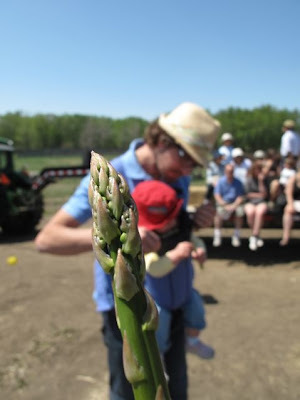 This weekend is possibly the last one for Edgar Farms asparagus. Go get some! Just this week we've had it steamed, with loads of butter and served with lobster at a Forage Farm table Dinner. We've had it grilled, in pasta salad, raw, and on the pizza above. 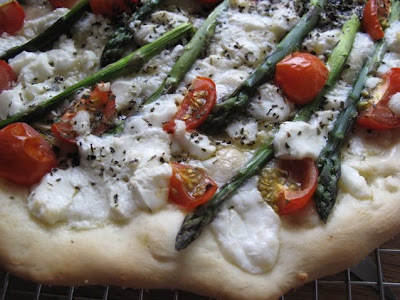 Lightly blanched asparagus with Gull Valley cherry tomatoes, Fairwinds Farm Goat Cheese, and some oregano. Got a fussy eater? Find me here, at Christie's Corner, sharing a few tips. Walking the dogs the other night I was seriously tempted to do a little midnight gardening. Now, I'm a thirty-something mom with a mortgage, a real job (as opposed to a McJob), and significantly less alcohol running through my blood than I did 10 or even 15 years ago. Midnight gardening is not something I should be doing. You know what I mean, right? Sneaking into gardens to pull carrots, pick strawberries, and sneak raspberries? Oh, maybe that's just what us bored kids in the 'burbs did. So there I am walking the dogs in the near dark. Business done, I notice this giant, neglected rhubarb plant in the corner of the alley. Just tucked behind someone's garage, begging to be chopped down, this lush plant called to me. "Pick me! Come on, you know you want to do it. Pick me!" The thirty-something mom in me prevailed and I went home with only a dog-poop bag in hand. A few days later, however, we were working on the fence with the neighbour. 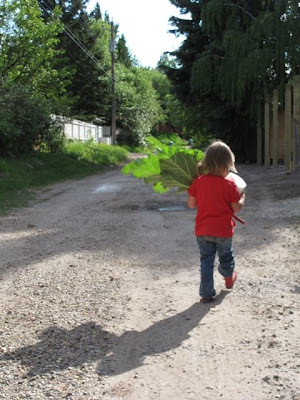 The girls wandered down the alley and when I chased after them I came across their rhubarb plant. I completely forgot that they have two of these plants. Since they would never harvest and use all of it, and they really didn't need to store one more thing, I volunteered to take it off their hands. Really, I'm that generous. 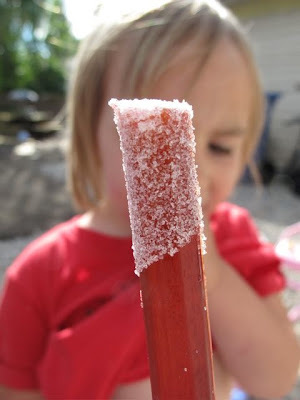 At this point it was necessary to bring out a bowl of sugar and introduce the girls to one of my favourite childhood treats - rhubarb dipped in sugar. We pulled up a pile of wood, watched Hubby cut some of that wood and our neighbour shovel gravel, munching away. Okay, I munched away, The Monster sucked sugar off and tried to peel her rhubarb, and Smilosaurus gummed the stalk and fought to put handfuls of sugar directly in her mouth. Perhaps the introduction was a bit too early? When it was time to get the girls out of the way of Hubby we came inside and baked. Conveniently, nature provides the perfect match for rhubarb, strawberries. I know it seems a little cliche, but they really are made for each other. There is a reason they mature together. Armed with the first of the BC strawberries I knew that nothing but a crisp was in order. Everyone else can have their cobblers, crumbles, and brown betty. I love me a crispy crisp. In my eyes, a perfect crisp has a slightly runny syrup, chunky fruit, and a crisp, oat-filled top. Pick your fruit based on the season, but don't mess with the top. Ever. No extra seasonings, no fancy additions. Simple, plain, and balanced. And whatever you do, please leave the nuts out. They just don't belong. Where it does pay to be creative is in the filling. Spice, limitless fruit combinations, and unexpected additions are all welcome here. 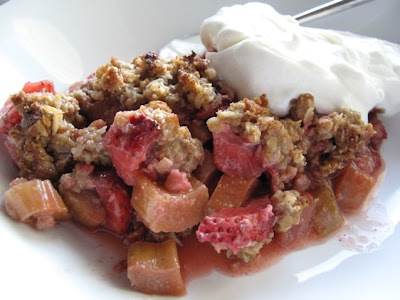 Looking to branch out - just a little - from my usual strong vanilla accents with the strawberry rhubarb crisp I dug through my recently organized spices. Cinnamon? Nah, too predictable. Nutmeg? Feels too wintery. Cardamon? Ooh, now that could be nice. Holy freakin' gawd, it was amazing! Try this. Now. When it comes to cardamon, a little goes a long way. It would have been a lot better if I had some whole pods to grind fresh, but a little ground, dried spice still worked wonders. It really was a perfect compliment to the tartness of the rhubarb and sweetness of the fresh strawberries. 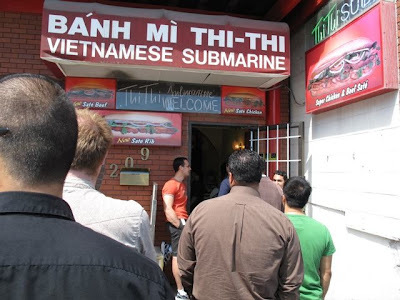 We invited our neighbours over for dinner. Good fences do make good neighbours. And rhubarb honestly got makes you a better neighbour. 1. Preheat your oven to 350 degrees F. Spray an 8 by 8 baking dish (or similar size) with non-stick spray or butter the pan. 2. Gently mix together the fruit through to the cardamon. Pour into the baking dish and set aside. 3. Cream the butter and brown sugar. Add in the flour and salt. Finally, stir in the oats. Do not overstir or mix because you can break up the oats and that diminishes the crispiness. 4. Using your fingers, top the filling with clumps of the topping. Do not press down. 5. Bake for 20-30 minutes, until the filling if bubbling and the top is lightly browned. Let cool and serve with ice cream, whipped cream, or yogurt. In case you were wondering, birthday parties for a three year old are so worth the effort. She won't remember it, but I will forever remember impatience for the last month - drama included - and the high of having all these people there for her, the Happy Birthday Girl. The drama on her part, and mine, was worth it. With so much competitive parenting going on these days I would like to think I am immune to it. We've been to our share of birthday parties of late and inevitably we do take notes. Usually those notes revolve around ways to make the party clean-up easier and how to sneak some wine into a kid friendly venue. Thankfully we have a great group of friends and family that were more than happy to simply come and hang out with us on a finally hot Saturday afternoon. There is a park across the street from our house, a rather convenient feature considering that we still have no yard. 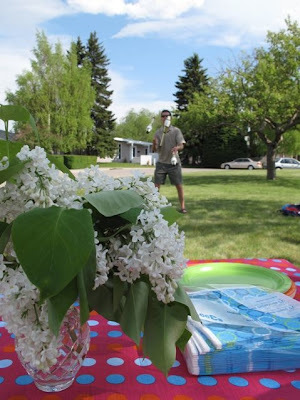 So we carried over a few picnic tables, a couple of quilts, a mess of sandwiches, some bubbles and balls for the kids, and had ourselves a picnic. 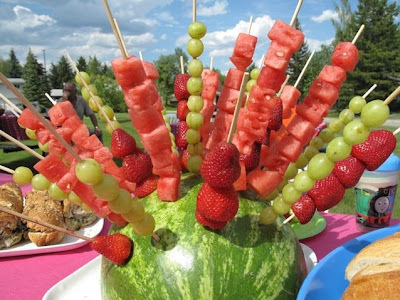 I realize that this fruit porcupine is more than a tad over the top for a picnic. It was a fantastic way to keep a now three year old occupied with prep work. 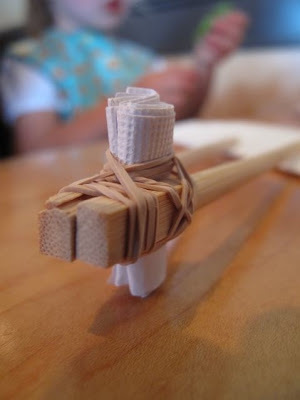 Skewering grapes, a new way to kill time and fruit. Plus, there were no post slurp watermelon rinds to deal with. Keep in mind that this is not a way to serve things if you have any distance to travel to your picnic. Remember the asparagus? Edgar Farms is still picking, so I'm still eating. 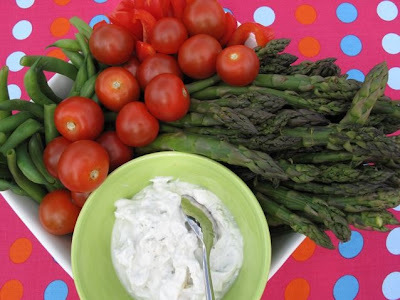 On my continued mission to indoctrinate, er... feed my friends good food I blanched some, along with some green beans, and served them with some Gull Valley cherry tomatoes and a homemade blue cheese dip. For the few moments when I sat down I was parked near this platter. I'm not sure how many people tried the asparagus with me hogging the plate. The rest of the menu included grilled veggies and Boursin on a whole wheat baguette, a recreation of the famous Italian Centre sandwiches (very well received and a soon to be picnic staple in this house), tabouleh salad, Holy Guacamole (We Got Chips), and some brewed iced tea and lemonade. 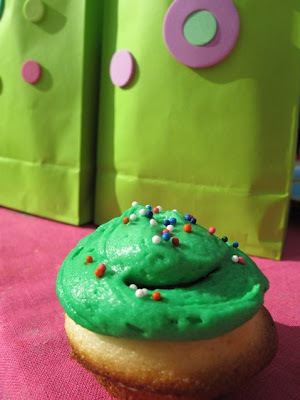 And don't forget the cupcakes! 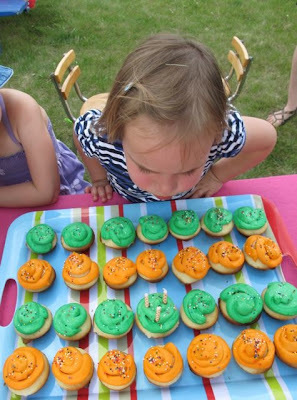 Speaking of the cupcakes, I'm pretty sure that the was the only food most of the other kids ate. I think my friends were maybe prepared for me and my tendencies because most of them brought their own food for the kids. Hey, I made peanut butter and jam sandwiches too! I thought it was pretty kid friendly with the fruit porcupine and veggies, but maybe that is only my kids? No party would be complete without a little entertainment. No clowns or facepainting here. We had Uncle Paul juggling fire! Sadly fire is not that noticeable at 4 in the afternoon. I can tell you that it is very noticeable after a few beers and once the sun finally sets in the summer. Unfortunately the kids always miss that entertainment. The very nature of a blog is part confessional. It's time for me to 'fess up. I've never been able to make Rice Krispie Squares. Yup, the laziest, kid friendly treat and I've never been able to make them properly. If you want rocks filled with rice cereal then I'm your girl. That is, until last week. My mom loves to make them for the grandkids and thus The Monster was asking for them. It hurt a little, but only a little, to buy the marshmallows and boxed cereal. I try to limit the processed food in the house, but I have to stop beating myself up for a few little treats. Besides, it is great dessert time fun for us to throw mini marshmallows across the table in an attempt to score one in a waiting, open mouth. And ultimately, score one for this mom - I've finally mastered the Rice Krispie square. My mom told me to add a bit more marshmallows than the recipe calls for and to take it off the heat as soon as those fluffy bits of corn syrup melt. It worked. Squares that stayed together but weren't like rocks. Oh, and The Monster was happy. So happy. Such simple pleasures. I'm all for treats and baking. I have no qualms with them having too much sugar, they actually self-regulate pretty well. But I didn't want the cereal hanging around, constantly teasing her and inviting the ceaseless begging of a nearly three-year old. Then I recalled a recipe that I saw from my favourite bow-tie wearing baldy, Christopher Kimball. Have I mentioned my geek crush on him before? I'm sure I have. He's so damn nerdy and cute. I digress. I remembered America's Test Kitchen doing a bit on perfect, crispy waffles. Guess what the secret ingredient was? Hell yeah, Rice Krispies! A perfect use for the cereal. The recipe uses cornstarch to help lighten the batter. Whipping the egg whites separately is not a new notion in waffle recipes, but the combination of the cornstarch, whipped whites, and cereal makes a very light batter. 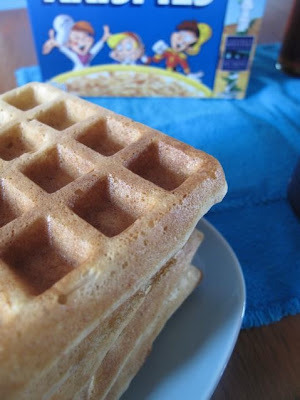 The cereal essentially melts, leaving pockets of crispy throughout the cooked waffle. I've changed the recipe a bit, adding some whole wheat flour to make myself feel better. And I prefer brown sugar for the extra flavour, but it works perfectly well with white sugar too. We've now made the waffles a few times. After so many attempts to find a light waffle that doesn't turn into a brick the second it comes out of the waffle iron I've finally found one. Seriously, these are crispy, light, and perfect for toaster leftovers. I can make a batch on Sunday morning and the girls have a few breakfasts during the week. 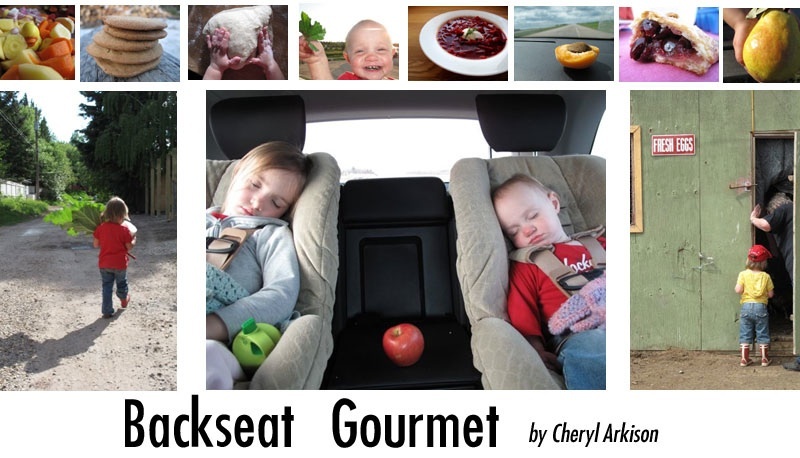 This is a great week for mom - dinnertime laughs, afternoon treats, and pre-made breakfasts. And all from a box of cereal. 4. Cook according the instructions with your waffle maker. Much to Hubby's chagrin I dragged him away from the yard and we made the drive to Edgar Farms' first Asparagus Festival. He was tired and tried not to be cranky, but the rewards were sweet. The girls sat on a horse and a pony, got to pet some brand new goats, ran around a hay bale maze and fort, and even went on a tractor ride. But the highlight of the day for me, and possibly Hubby, was eating stalks of asparagus that we'd just picked from the ground. 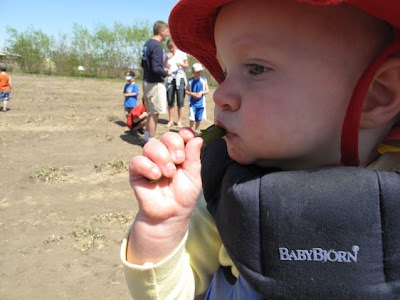 It would never have occurred to us to eat asparagus raw, but we were trusting the advice of Elna Edgar, and she would know. 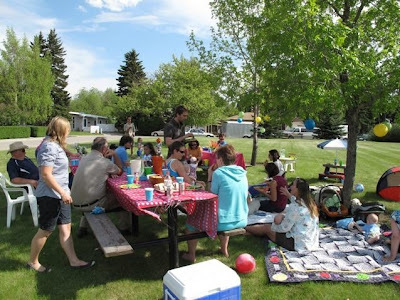 Elna and Doug Edgar own and operate their farm, with their daughter and son-in-law just South of Innisfail, Alberta. They are a traditional grain and cattle farm. But they also grow fantastic peas (so I am told) and Alberta's only commercial asparagus. And they've been doing it for nearly two decades. So, when Elna tells me to take a taste of asparagus right from the ground I do it. Wow, what a revelation! Other than the fact that raw asparagus tastes more than vaguely like peas, it was crisp, light, and purely fresh. Unlike tomatoes that you pick in the late summer sun this tasted like cool spring. The Monster and Smilosaurus had as much as they could eat. Good thing the baby got her front teeth a few weeks ago. We saw the asparagus fields last summer, long after harvest. Did you know asparagus is a fern? But as soon as it comes out of the ground the spears can be picked and will continue to grow. The only thing that stops the Edgars from a continuous harvest is the need to let the crowns rejuvenate to produce next year. During spring, however, these custom pickers travel up and down the fields picking the tall enough crowns. It is a near continuous harvest for more than a few weeks as the crowns can grow over 6 inches a day! 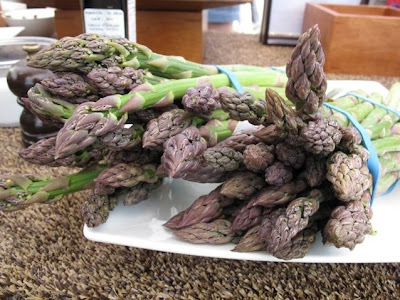 Once we returned from the fields we tasted some freshly grilled asparagus from both Wade Sirois from Forage and Infuse Catering and dee Hobsbawn-Smith. Grilled is my all-time favourite way to eat asparagus. A little toss with olive oil then just a few minutes on a hot grill. You can drizzle some lemon or vinaigrette over top, but I will happily eat them like fries straight off the grill. 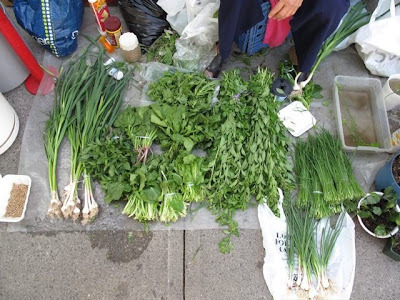 One of the best things was hearing people's surprise when they heard that no, you don't need to break off the ends or peel asparagus when it is this fresh. And you don't get any fresher than off the picker's truck. 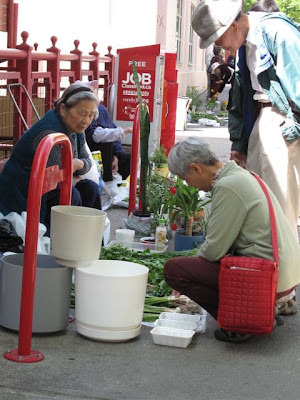 Asparagus Festival is over until next year. Okay, this was the first one and there are no guarantees, but I'm betting that we and many more will be back next year. 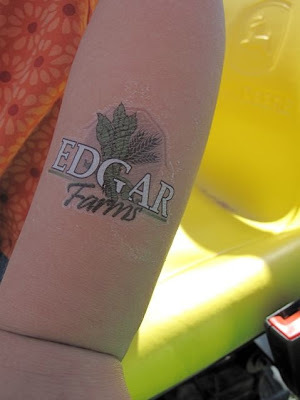 You don't have to wait until then to go to Edgar Farms. You can visit them daily at their farm store - where they currently have asparagus, rhubarb, their own beef, and a variety of asparagus pickles, relishes, and some sweet berry jams. You can also visit Edgar Farms with the rest of the Innisfail Growers at farmers' markets around the province. 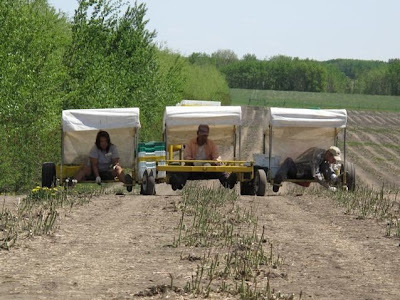 And make sure to stay on top of things through Doug Edgar's blog, he'll keep you up-to-date on harvests, this year's pea crop, and more on-farm events.